To make sure you get the best deal we'll show you great prices from all of our drivers, including Tee Murape's Rapid Sameday Couriers Ltd 24/7 , if they're available on the day of your move. Have a question for Tee Murape's Rapid Sameday Couriers Ltd 24/7 ? No problem, send them a message and they'll email you back as soon as possible. If you have a more general question you might find it answered in the FAQ, or you always contact one of our brilliant customer service team. * Tee Murape's Rapid Sameday Couriers Ltd 24/7 won't be able to see your email address. Please view my previous customer reviews below. The guys were incredibly helpful and patient due to unforeseen circumstances making the move more complicated. Very professional and helpful. Nothing was broken and the driver even brought back the bulbs we forgot the day after! Very good service! I have booked a slot at 11.30 and the driver showed up at 12:10. I had to rush because my slot would have expired at 12:30. We are sorry that the driver was delayed to your booking, however, your booked hours would only begin from the time that the driver arrived. Excellent experience using the service, added an extra helper last minute so appreciated the flexibility. Good banter along the drive to the new place. Would recommend and use again should I move. Couldnt recommend him more! Prompt, friendly, helpul and chatty. Ignore any bad reviews below we were so happy with the service. Thanks again! When booking with us you are asked to declare if there are stairs at either collection or delivery address, and if so, how many flights. You are unable to continue with the booking without making this selection. Move was booked to start at 11pm however the van didn’t arrive until just gone 12.30pm. The van was loaded with all the smaller boxes and bags first rather than the large furniture which meant it had to basically be emptied and repacked as it couldn’t then all fit. Items were not carried very well and I had a handle broken off a chest of drawers, my mattress ripped as it was dragged along the floor and other items have been chipped/marked. I was also charged an extra £10 to carry just a few items up a flight of stairs to a bedroom (even though the previous driver collected them for no extra costs involved?!). 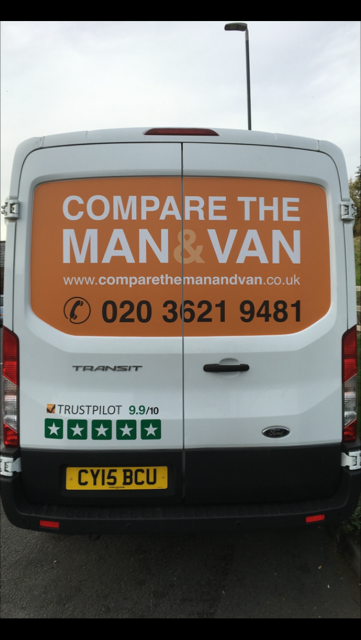 I have used Compare the man and van 4 times now and this was my first negative experience as all the other drivers have been very competent, helpful and friendly. Sadly this service was a massive letdown and for the amount I paid, I would not use the service again and will probably look around elsewhere next time. Just to note this wasn’t even the driver I originally booked, it got changed by the company on the morning of the move. Great guy, friendly, chatty and hard working. Will definitely look him up again as and when we make our next move! Driver a bit late, but advised in advance. Otherwise, helpful, fast and courteous. Thanks! Driver was 30mins late and booked for 2.5hours but was only with us a total of 1hour25mins, leaving more than half the job undone. There was a mix up with the amount of flights of stairs and after a lot of persuasion he carried 2 items of furniture up the stairs but said he needed £10 per flight given to him in cash to carry anything further. I stated that the reason we booked the driver for longer was so that we could have some assistance rather than doing it all ourselves! Not happy with the overall service. Whilst the guy was polite and nice I wouldn’t go through this again as it made an already stressful situation worse. You are asked to declare any flights of stairs when booking, and this is then factored into the quote you receive. As no stairs were included in this booking, the driver was within his rights to ask for his stair charge to be paid if you required him to carry your goods up/down any flights of stairs. Tee was great! He was prompt and helpful, and was accommodating when I requested an extra collection point at the last minute. Definitely recommended. Ted Murape was excellent. Did a very professional job indeed. Delighted with his service. Thoroughly recommend to anyone needing a large van plus man and wants to be sure of getting a guy who does the job properly. Thank you very much, Ted. Hi is a very friendly guy and very helpful. I wouldn’t hesitate to use him again. Many thanks T .
Tee did a fantastic job, super helpful and a great guy. Would happily recommend. After Any Van dumped my old sofa that was being delivered to my niece outside her flat instead of delivering it to her as instructed. Mr Murape saved the day at the last minute too. He updated me constantly with where he was whether by a text or call. He managed to get a very awkward sofa up stairs and into my nieces flat. The sofa was 12 years old, but expensive, so to have just dumped it and left it would’ve been just awful. I will use Mr Murape again and recommend him to everyone. Thank you so much! Worked efficiently to help load and unload on multiple locations. Excellent Man with a van, quick, efficient and no problems. Would use them same guy again, if I need to move. On time and very helpful driver. Really nice service. Felt really good on the van and the driver was of great help! Can’t fault a thing. On time, to the very minute. Was quick, easy. Very happy. We can confirm that this driver carries blankets and straps as standard, but they were not required for this booking. Was around 5/10 minutes late but was friendly, extremely helpful, loaded everything in himself, was efficient and quick. Would book again! Excellent service, driver arrived on time and was very helpful with arranging the items in the van so we could maximize the space. The van came with straps and blankets and also a trolley to move large items. Would highly recommend. Quickest I’ve ever moved, super efficient and friendly. Great experience overall. Great service ! Driver helped loads and had a trolley which made everything so much easier. Would recommend to anyone looking to move! Overall the driver got the job done, but I would not book him again. I had to throw away a duvet as it was covered in dog hair (he sometimes brings his dog to work I found out). He also had to move the van towards the end of unloading so he left all my items on the street, including three large bookcases; as I had paid for him to do lifting I was disappointed that I had to move all of these myself. Most of the lifting was done by myself and my friend, and he simply packed the van. The driver also decided to yell aggressively at another van that asked him to move his van so they could pass. Real shame as I had high hopes for this driver, wont be using compare the man with a van again. Hello, my name is Victor and I am disappointed and not really satisfied with the service of my driver. I booked a VAN at 10.30 for 2 hours as I was working at 1.30. At 8.59 I received a text saying that my driver would be at 10:45 what I really understood so I decided to wait for 15 min. When it was 10.45 I called the driver as he didn’t do it and he asked me if I had received the text and he would take other 5-10 extra to come. I was ok as I though he was on his way to get here. After 45 min. (11.35) I called him again as he never did it and he didn’t answer the phone even trying 4 times. I started to feel confused as I didn’t know what to do so I called customer service department. They cancelled my driver and sent me an email with the new driver info (he would get here at 12, what it is an hour and a half later than my booking). After 5 min, a driver came (I wasn’t sure if he was the first or second one). Everything was so confused but I had a moving to do and I was already late to work. When the driver started to help us (he didn’t really help us much as he seemed upset with me and busy with the phone), he asked me why I had called the company. I explained him that I was so confused and didn’t know what to do and I didn’t really understand why he didn’t call me to let me know he would be late. He insisted that the post code I gave for the booking was wrong (which I checked and it wasn’t wrong) and I decided to continue with the stuff as it was more important for me than find out who was the blame on. He didn’t take care of the stuff, placing soft items firstly (like bags with pillows, or a painting with a frame...) and then the heaviest things on the top (WHY? ),even throwing some bags in a rude way. At the beginning he was who was loading the van but I had to ask him to swap because otherwise everything would not fit inside. I had to re organise the van in a common sense way. (firstly boxes and wardrobes , bags and all the rest). I asked him to help to my flatmate with a chest draw and when he was going to place it in the van , he broke it, and then it was the first time he apologized. What I wanted most in that moment, it was to finish with the nightmare, so I said it was ok. Once we were already on the way to my new home, the situation become much worse. He still seemed upset and he didn't talk at all. Then, he got a call, apparently from his manager, and try to convince him that was not his fault, and saying he was just 5 min away when I called him at 11.30am and the post code was wrong. Then I explained through hands-free that I didn't do it to complain, so I did it because I didn't know what to do he didn't answer the phone. When this call had finished, the driver in a really rude way told me that I shouldn't have done that as he would get less money. (Funny thing as I got paid less as well as I was late to work because of his lateness). I apologized as I didn't want to put him on trouble. His rude attitude was what made me feel really uncomfortable and disappointed) I accepted him to be late, him to never call me, him to break chest draw, him never to help us, him to talk to us in a rude and intimidating way, and on top of that, he tries me to feel guilty when I called customer service department. What I think is he never assumed he made the first mistake (to be late), and if he had done, I had accepted it, but he didn't. I would like to get a refund, as I didn't get the service I was promised, and I have my chest draw broken and one missed hour for being late at work. I have some pictures, as a proof, that I would be glad to send you if you really need it. Firstly, as I do with all my bookings if I am running late, I had let the customer know prior to the job even starting that I was running late. I then phoned him again to let him know I was actually delayed which most people are fine with. When I arrived at the booking I didn’t realise that he had called CMV. I asked him in a normal manner and he said yeah I was only advising him for the future I am quite understanding but some are not so I was just telling him. Great service, very professional, polite, helpful and patient. Would highly recommend this driver & his excellent service. Great guy, really helpful. Had good chat too! Recommended. Excellent service, was very good with the fragile items and put a lot of thought into where would be the safest place for everything. Good safe driving too. He worked very hard, couldn’t have wanted more, 5 stars! Arrived early, very helpful, Good Lad. T was a fantastic driver. He came early and helped with the loading and unloading. He had a trolley on board which was very helpful too. We had certain fragile items to be transported and he drove smoothly which was very much appreciated. Highly recommended for someone who needs a fast, efficient and effortless move! Lovely lad, very friendly and helpful. He was only late because he had a punctured tyre, so not his fault. Really happy with the service! Very efficient driver. His experience on the road was most evident. Very friendly and helpful. Great guy and a great move. Highly recommended. Tee was prompt, polite, efficient and patient - in a word brilliant!! Thank you Tee - you get 5 stars from me! Punctual, friendly and made the move easy. Very friendly and helpful chap. The van was sufficiently large and on time and the driver was really helpful. He was a couple of minutes before time, even when was peak hour. T is a nice guy - very helpful and strong. This was a self loading booking. Outstanding service!!!! I will be using them again and recommending them. Thank you for making everything from start to finish stress free! Great help, would definitely recommend, made what had the potential to be a stressful experience very easy. Tee, was great. On time and helpful. Good guy. The whole process from booking to moving was very easy, fast and convenient. The driver was very helpful, polite and professional. Driver was very helpful and we completed the move within an hour. Friendly guy, he arrived early after calling me to ask if I was already ready to move. It was a fast and efficient service with particular care for fragile items that the driver protected with blankets. The driver was 15 minutes late, but he was friendly and helpful. I had underestimated how much I had to move, but the driver was understanding and we managed to get everything done on time. He was a f**king legend. Tee was great, supper on time and willing to help! Very kind and careful in the road while driving! When I had arrived at the customer's address I asked her if she needed a larger van because she had only booked a small van and what she was asking me to move required a bigger van (hence the quote change). Although the customer paid for help, she only booked for 2 hrs and the drive time was 1 hr 8 mins so by the time we reached the delivery address the booked time had run out. I explained that if the customer wished me to continue working after that point, my half hourly rate would apply and and she was quite happy with that. Im so so happy I decided to go with Tee hes a true professional he loaded and offloaded everything himself and took the hassle out pf my moving. Thank you Man and Van for a very good service and I would recommend Tee anyday. An attentive driver, will use again. Quick and efficient service. Top man ???????? Really good and efficient service. Tee is super friendly and professional. Got the job done really quickly and efficiently too. If you're looking for someone reliable and efficient I would highly recommend Tee! fantastic service. in time quick and respecful. i would definitely hire Tiwalpa again. blankets and straps not needed as i inly had bags and suitcases. My driver was amazing .. I've moved over 4 times this year and he made it the best and most comfortable experience for me. Plus he was Fit so that's a win ???????? He came with a van that was apparently to big and charged us an extra £25 for that even though we finished in 1h15 instead of 2 hours. Not really happy about this. As you booked a small van load, but filled the capacity of a medium van load space, the driver was entitled to charge you his medium van load rate. We are pleased, however, that the driver managed to finish your booking within your booked time. Tee was polite, friendly and very helpful. On time, quick and efficient. good job! My driver was extremely helpful and patient, highly recommend! He was very efficient and quick. Not sure if he had straps and blankets - I didn't ask for them but he didn't offer. The driver was there early and was very helpful. Will definitely book again. Great service. The driver was very helpful and friendly. T was a great help moving today. Thank you! T was a bit late but we were notified. Other than that we had a great move. Nothing damaged, driving was sound and smooth ride. Unpacking at the destination was very quick and problem free. Very friendly and helpful , the whole process was stress free and quick ! Driver phoned to inform me he was running 15min late - not a problem - excellent service. Tapiwa was very helpful, and a pleasure to have him around for the move. Highly recommended! T Top Man for the Van !! The driver arrived with 15min delay, but he advised me before hand = no issue there. We rely on the customer to book the time they estimate will be needed for their trip, as only you know what you are moving. This therefore cannot be the driver's responsibility. The driver was punctual, efficient, and friendly. All of my belongings were successfully transported without any damage. I can't fault the service. Recommended. I would give tee 5 stars if it wasn't for a broken plate and glass. Really friendly guy. Although he was late he text ahead, so I could plan around him. Would recommend! Tee is brilliant! Very helpful, brilliantly chatty, and insightful. I highly recommend Tee for your next and all moves. T so good at his job, helpful beyond the call of duty and we actually had fun moving - thanks T! The driver was very helpful, he made the move less stressful and even know I had more stuff than the van could take he made it work. I will definitely recommend, top service. He was very nice but didnt seem very experienced in how to move things. Would recommend he bring a few basic tools with him. Driving ability was very good. Really nice guy, good driver, got us to our destination ahead of time. Least stressful move ever. Super quick! Really helpful. Would highly recomend!! Tee was great. He helped me with all my stuff. Plus, the time on the road was really flying as we talked all the way. I am very happy how it went. The driver was fantastic, he made the move very smooth and easy. I would recommend the service to anyone. On time, packed the van in an instant and drove really well. On top of that, T was a really nice guy and good company on the way down. Would highly recommend. The driver was great. He was early, really helpful with loading and unloading the van and the move was far easier than I was expecting! Perfect service, couldn't have asked for a better move. He was friendly, chatty and packed up my stuff super quickly. Thanks so much! although 20min late, driver was very fast in moving my things, quite efficient and finished in 1.5hrs. T was super nice and made the stress of moving a little better. Would def recommend! The driver was only 20 minutes late which is understandable in London traffic, but he was contactable the entire time - the move was efficient and the driver was helpful and friendly. I would definitely recommend. Can't thank this driver enough. Polite, friendly, talkative, made a stressful situation easy by taking care of the carrying of boxes. The perfect person to do a job. Can't recommend highly enough. Very helpful - great service, thank you! Very skilled and efficient as well as being friendly and helpful. T - the driver was really helpful, professional and efficient. He was chatty and easy to get along with on the journey. I would highly recommend T.
Driver arrived perfectly on time (10 mins early) and he helped me to load and unload quickly and safely. I highly recommend him for any job. Excellent service! Good contact with driver, friendly and managed to change my time slot at last minute! Would recommend to any one who wants and reliable and smooth service. Driver was great - so helpful, friendly, punctual and the move went off without a hitch! Would not hesitate to ask T again, or to recommend him to friends. Gabriel was very helpful, polite and friendly. He packed the van so well that we got everything in one trip without damaging anything. Two thumbs way way up! Bikes were scratched and 1 brake was damaged when we arrived, he didn't know the way and asked to use our phones for he 4g, wing mirror missingnon left side of the van. Not a good start to the day for our cycle event. Punctual, friendly, professional and efficient. A very helpful and efficient service. Probably the best time spent with a total stranger. He was helpful, relaxed and a chilled conversationalist. Would highly recommend and will definitely use this service again. You do, of course, have the option to amend your booking, up until it begins. There can be no refund of booked time as this would be totally unfair on the driver. This is because if you book for, say 3 hours, the driver is unable to take on any other work for that whole 3 hour period. This is why we always recommend that you underestimate the time you need the van for as if you run over the time you have booked, the driver will have a half hourly rate which will then apply and will always stay with you until your move is 100% complete. Top man - good laugh, very helpful and brilliant experience. T was great. Very efficient and also funny on the drive over. Very helpful and seemed like a cool guy. quickly . Would definitely recommend. This customer was asked in an email on the morning her complaint was received to please allow us some time to look into this matter for her, and an opportunity for the driver to respond. She chose not to. She has, of course, been refunded for the driver's 3 hour delay to the booking which we agree is totally unacceptable. However, we would have much preferred that the customer had allowed us some time to resolve this matter for her before choosing to post this review. He was on time and really friendly and helpful. Would use this service again! We are very sorry that the driver was this delayed to your booking and had we been informed of the delay, we could have sent you an alternative driver with an earlier arrival time. We have, of course, refunded you in line with our lateness refund policy and apologise for any inconvenience you may have suffered. T was excellent and very professional - I would highly recommend him. Tee is friendly, helpful and I would recommend and use him again. It was a last minute move and I couldn't have asked for a better driver. Thank you for everything! Many thanks to the driver, he made the stressful experience of moving house very easy and comfortable. Tapiwa was very helpful and polite and we would be happy to use him again. Great guy helped me with everything, even though I didn't request help! Big Thumbs up! He was late, but only because the previous job ran over. Great help, and a nice guy. Very friendly and helpful would use again and recommend to anyone. Nice, helpful driver. Highly recommended. Fantastic service. Tee was helpful, efficient, professional and made the moving process easy. Would highly recommend. Great guy, very helpful and did most of the lifting which made my move so much easier. Tee was profession as well as excellent company. Highly recommend! Using again in two weeks! Really can't flaw his service. Tapiwa was extremely helpful, really friendly and went above and beyond what he needed to do to help me move flat. Would definitely recommend. Although he wasn't on time I didn't mind. The van was clean and the driver did everything for me. I would defiently recommend. Thank you! Tapiwa was brilliant, very helpful with the move and professional. I would easily recommend him to my friends. I would recommend to use the service with Tapiwa. He's very nice and helpful! Great move! Although the driver didn't arrive on time, he did give me a call in advance to apologise and notify my of the delay which was very considerate. The driver was very kind and respectful. He provided good company during a long drive. He took great care with my belongings and came well prepared with a trolley for my heavier bags. He showed great willingness to help with the loading and unloading, which I very much appreciated. Overall, the driver is cool, helpful and an excellent conversationalist who made me feel very comfortable. Would highly recommend. The driver was fantastic and so helpful! I had to move last minute and I was on my own and he went over and above. He was very friendly and professional and on time. Would definitely use again. Thank you. Very friendly, polite, conscientious, efficient and trustworthy. Would highly recommend. Perfect move! Thank you for the help, highly recommended! Smooth and quick -- will definitely use again and highly recommend! I was meant to say STRESSFREE! On time and excellent service! He was very helpful and also personable. I'm glad I had his help, it made my move feel easy and efficient. Friendly guy, on time, good van - would absolutely use again. The guy helped me carry a large sofa down four flights of stairs. Super service! Fantastic service, helpful and friendly, would definitely hire again if needed. Spot on arrival, fast ant excellent servis! Highly recommended and definitely to book again. Compliments to comparethemanandvan!!! This guy should be already rate HERO. Good, quick, responsible, willing to help. Just book him and I can assure you will be happy with his work. I would definitely recommend this service.Also the driver was really professional and helpful. The driver was not on time but he called in advance to tell me so that was ok. He also brought one extra helper to help. The move was fast and efficient. A pleasant experience overall. Really nice and friendly, even help us carry our stuff... 100% recommended!! Tyn was great, helpful and moved my boxes in no time and without any fuss. would recommend!! Very efficient service. Such a friendly driver too. Excellent service and the chap was absolutely fantastic. It was an effortless move! Fantastic driver, really helpful and friendly. Would definitely recommend using him. My driver was Tapiwa, he was genuinely helpful and respectful. Did great job beyond what I was expecting! Was worried sick of marks on walls from the move as the house I am moving in to was newly painted and so will be really visible to the owner if marked, also my room was up to the 4th floor. Fortunately I worried unnecessarily, Tapiwa was really careful with things not needing to tell him at all, plus he was fast and obviously not wasting any of the time just to create more time/money. Highly recommended! I had some glass framed pictured moved and T looked after them very well by driving extra slowly. Very pleased with the service. Keep it up my dear.I recommend you as a super star and very respectful. Really helpful. Got everything much faster than I expected. Also had good chat on the road. Would highly recommend him. I would definitely recommend T to anyone looking to move house. He was happy to lend a hand and a good laugh. A big help on what could have been a very stressful day. Cheers! Driver let me know he was running late, was very kind and helpful, packed the van although I hadn't specified this. Would recommend. That was the first time that i hired a van online, i can honestly say that i was more than happy with how fast and easy the application was, the driver was ontime, he was very helpful. I will definitely be using this app in the future and i will tell my friends about,it is a reliable and affordable. Excellent 5 stars. Great service, very fast and overall really pleasant! Would totally recommend! Super reliable, responsive to queries prior to the move and really personable. I would 100% recommend and use again myself. T was really nice, he was sociable and we talk about everything whilst I was in his van! I highly recommend him! He is professional!!! Excellent service. Would highly recommend. Thanks Tapiwa! Everything went well. Tapiwa was on time and the help of a person he was training which meant that the entire move was done in 1 hour and a half instead of the 2h30 I booked. I was really happy and would definitely use Tapiwa's services again in the future. Very quickly and efficient. Would highly recommend. I was very happy that he was on time and quickly packed up the van. There weren't straps or blankets, which was a shame as I had a full-length mirror, but we managed to pack it in with my blanket. My one complaint would be that we got held up in the car, so he was waiting for a bit outside my property in the van. When we arrived, he was going on about how he wanted to get this done because his next job wanted him earlier. I'd paid for 2.5 hours, so thought that was a little rude, given we weren't close to the end of my paid-for time. But, overall, a good move. T, the driver, was very professional and polite. Very helpful driver and all very easy. I would definitely do this again. Really helpful. Assisted with the move even thought he didn't need to. Really nice guy. Definitely use him again and recommend him. Made up for other short comings with a pleasant, friendly personality hence the 2 stars instead of 1 but he was 45 minutes late because he couldn't find the location - he could have emailed or rang the day before to check how to get into central London; he didn't have any blankets for the fragile items like a mirror, TV and large, glass table top; and he really tossed the furniture about, getting my sofa wet when he dragged it through a puddle. Overall, not a good experience and not one I'd repeat. I thought the job went completely fine apart from the fact I was late, which I warned Esther of prior to the move. This was unavoidable due to road closures which she wasn't aware of. As for tossing her furniture about, I don't know how I would have done this as we were both carrying the items together. Lastly, she noted that I got her sofa wet which I find an odd statement when the whole thing was covered with plastic and it wasn't raining that day! Big thanks T! You were very efficient and I would be happy to hire you again in future! Great service, really nice guy too! My driver did a fantastic job. He helped me move my belongings into my house and was just a really nice man. Was over an hour late, and left before getting all of the boxes to the new flat - relying on us to finish the job. Had much better service in the past. He went above and beyond, really nice guy, very professional. Would highly recommend! Pleasant, on time and helpful. I recommend. Really nice friendly and helpful driver. Really nice driver and helper and even though they were late they text and let me know. I would definitely use them again. Although not on time was only a little late and kept us informed. Driver was really friendly and really helpful. Informed me before that he would be late. My diver was fantastic! A great employe. Nice and helpful driver. Great experience! Very friendly chap and would recommend him to everyone! Really great, super helpful. Kept us in contact. Service with a (good) smile.